What can make someone a monster? Kim Min-suk, who was the assistant director and screenwriter of the widely known Korean movie “The Good, The Bad, The Weird”, makes his directorial debut with “Haunters”. Moreover, Kim Min-suk pens the script, while the popularity of the movie led him to co-write the script of the Japanese remake, holding the title “Monsterz”. “Haunters” aka “Psychic” made an appearance at several international festivals like the 2011 (47th) Chicago International Film Festival, 2011 (27th) Warsaw Film Festival and the 2011 (20th) Philadelphia Film Festival. The film starts with the year 1991. A mother with her leg-impaired child Cho-In (Gang Dong-won) try to reach their home, on a rainy day. After they arrive to their house, the mother pleads to the boy to always have his eyes covered, even when he eats. It’s not long until the child’s abusive father finds them and starts to beat up the mother. The young boy can’t take it any longer, disobeys his mother’s orders and removes the cover from his eyes. He steadily approaches his father, who seems that his soul has left his body completely. The father, lifeless, moves slowly backward in a crowded street where he twists his neck with his own bare hands and falls dead on the ground. After the death of the boy’s father and the failed attempt of his mother to kill her own son, we fast-forward to present year 2010. A 33-year old man, named Lim Kyu-nam (Go Soo) works at a scrap metal yard. Sadly, he loses his job after suffering a terrible accident, despite his impressively quick recovery. Lim Kyu-nam, now unemployed, finds a new job at a pawn shop called Utopia owned by Jung-Sik (Byeon Hie-bong) and his daughter Young-Sook (Jung Eun-chae). One typical, full of happiness day, while Lim Kyu-nam is at the pawn shop with his friends from the scrap metal yard, suddenly the door opens and Cho-In walks in, wishing to rob the shop. No one is able to have control of their thoughts and movements, except from one. This is no other than Lim Kyu-nam who has, to his surprise, the capability to fight against Cho-In’s mind control abilities. This fateful meeting of the two extraordinary men leads to conflicts between them and a cascade of events. “Haunters” is one of the rare fantasy movies coming from South Korea and deals with people either blessed or cursed with human superpowers. There are various important innovations that shape the film into a novel superhero movie. One important alteration is the combination of drama, action and fantasy with three-dimensional characters and various underlying messages. Generally, “Haunters” does not only offer action but also explores, to some extent, one of life’s biggest themes and conflicts. On the one hand is the importance of understanding and accepting all people, despite their obvious or unapparent differences from the masses, and on the other hand is the desire of people to fit and to be part of what is widely considered as socially acceptable and normal. Furthermore, the film puts a clear question and answers it: What can make someone a monster? Another important innovation is the focus of the production not only on the hero, but mostly on the villain. The whole production puts an emphasis on the villain’s thoughts and concerns through his voice over. One final originality is the appearance of actors of different ethnicity, which rarely happens in Korean productions. However, “Haunters” has some drawbacks. Firstly, regarding the script, there are some obvious plot holes. For example, the fact that the police did not call an investigation immediately after the incident in the pawn shop and did not obtain the CCTV footage in the first place. Furthermore, there is no explanation for Cho-in’s and Lim Kyu-nam’s superpowers and why the latter is unaffected by the former. Finally, there is one more vital flaw. 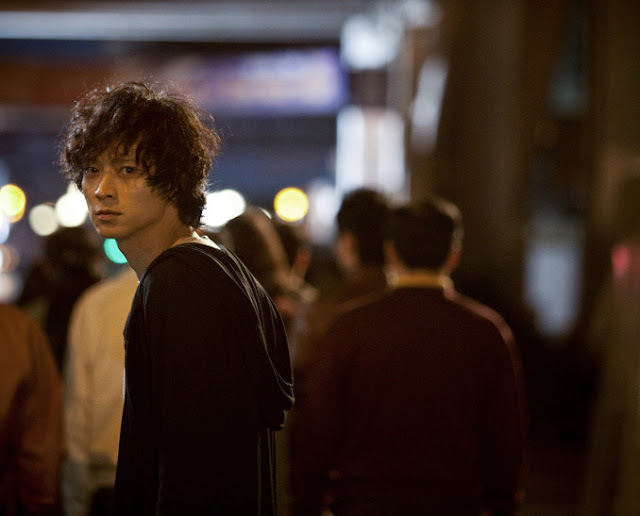 Director and writer Kim Min-suk seems to put some effort to shape Cho-In’s character into at least a sympathetic one, but unfortunately, he missed the chance to ultimately achieve this, when he made Cho-In capable of harming an innocent baby. However, the aforementioned drawbacks and the very few far-fetched scenes do not deduct from the movie's pure entertaining value. 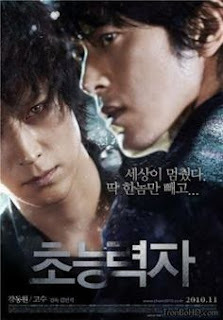 As for the cast, Go Soo is magnificent in the transition from a kindhearted, carefree, young man, unfamiliar with his superpowers, to a devastated figure that attempts to punish and bring to justice the man that is responsible for his unhappiness. Gang Dong-won is also excellent in the portrayal of a physically weak man, who wants to find happiness and shows glimpses of humanity in the beginning, but eventually descents into madness and evilness. Kim Min-suk proves that he is a skillful director and this is especially evident in the opening sequence, both in terms of narrative and technically. 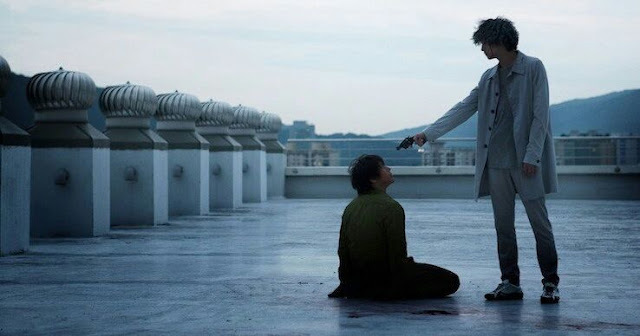 Moreover, the cinematography by Hong Kyung-pyo is excellent in all the scenes where the two protagonists confront each other, utilizing their superpowers. Also, Kim Sang-beom’s editing maintains the impressive pace of the movie. 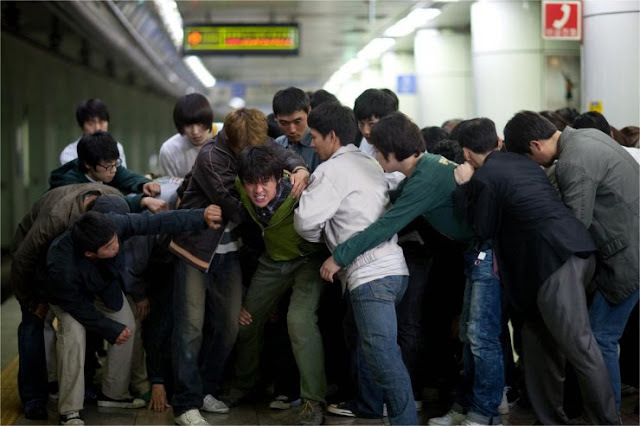 Finally, the music by Lee Jae-jin adds tremendously to the buildup of tension and suspense. “Haunters” is far from being a masterpiece of the Korean cinema. Regardless, it proves that Korean filmmakers are not only capable of producing deeply moving melodramas and bloody revenge thrillers, but can also create successful fantasy movies. “Haunters” is a movie that is a must-watch for the fans of superhero movies and a prequel is truly welcome.